NFL star JJ Watt on Monday brought some joy to the Santa Fe high school shooting survivors at a Texas hospital. Watt appeared in photos smiling next to the children at Clear Lake Regional Medical Center, where some of the 13 injured were recovering. One of the victims, Sarah Salazar, was visited by Watt. According to her mother Sonia, she had a tube taken out of her prior to the visit. 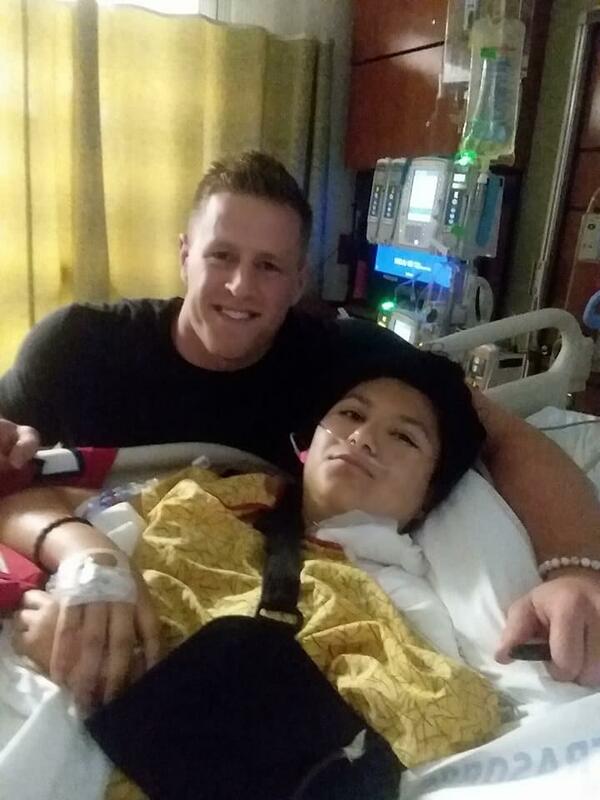 "JJ Watt visited her right after and it put a smile on her face," she wrote in the Facebook post. Another student who was hurt, Clay Horn, had been campaigning online in hopes of visit from his favorite NFL player. He got his wish earlier this week. Days earlier, the Houston Texans' defensive end offered to pay for the funerals of the ten victims in the shooting. Watt is known for his humanitarian efforts. In the aftermath of Hurricane Harvey, he helped raise more than $37 million and handed out supplies to people in Houston in need of resources. He personally donated $100,000. Eight students and two teachers were killed at Santa Fe High School last Friday. The tight-knit community of Santa Fe is still reeling from a tragedy that many thought would never happen in their small town. "We're grieving differently. Mainly, we just want to be left alone -- is what the community wants," McGuire said. "We're just trying to get back to normalcy." Shooting suspect Dimitrios Pagourtzis, 17, is currently in county jail under suicide watch. Antonios Pagourtzis, the father of the suspected shooter, told the Wall Street Journal his son was a victim of bullying.